The Alexander Turnbull Library Endowment Trust congratulates the Turnbull Library on having further collections selected by UNESCO as significant pieces of New Zealand memory that should be preserved for all time. The Jack Lovelock Papers and Cambodian women in New Zealand oral history project were selected by the UNESCO Memory of the World New Zealand Trust. They were announced at a ceremony held on 26 November at the National Library of New Zealand. 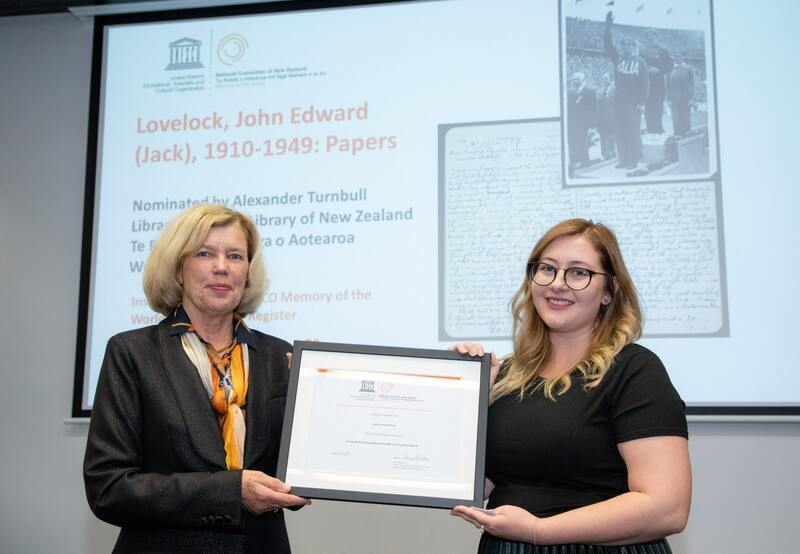 The Jack Lovelock Papers are significant on a number of levels; as a record of events and achievements that continue to resonate in the national consciousness, and which have made a major contribution to the standing of this country in the world; and as a primary source for research into the history of professional sport in New Zealand and the development of sports science. The Cambodian Women Oral History Project is significant as the first inscription from the Library’s Oral History collections. The project originated as part of the 1993 Women's Suffrage Centenary, and is a tribute to the vision and persistence of Niborom Young, who conceived the project and carried out the often harrowing interviews to an exemplary technical standard. You can find out more about these and the other six inscriptions on UNESCO’s website.